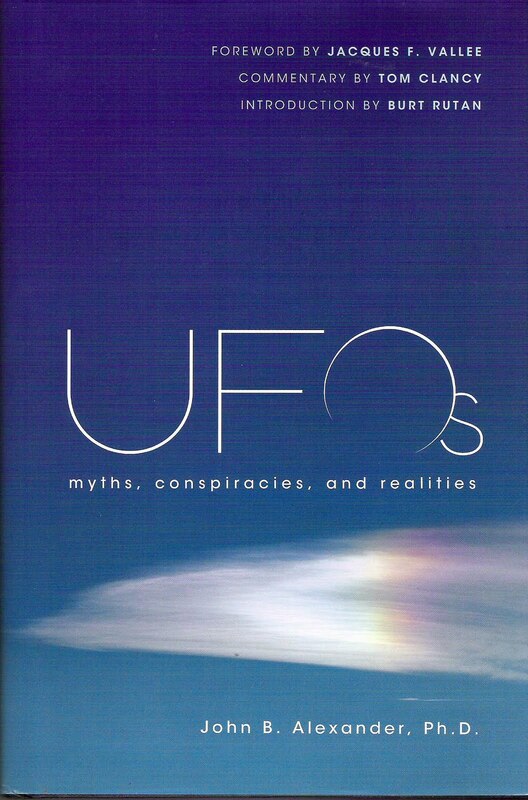 I've been reading Dr. John Alexander's new book "UFOs - Myths, conspiracies, and realities." It is a fascinating read, strong on interesting analyses of important aspects of the UFO problem and important reality checks on some key controversies, and perhaps most controversially a number of intriguing, but I suspect, circumspect and limited insights. I did find the book an intriguing read but I regularly found myself thinking about what was not included. I did enjoy the book and it certainly deserves repeat reading, close scrutiny, and hopefully, some opportunity for further elaboration from John Alexander himself. I have to say that despite the many worthwhile matters described I would have expected a lot more clarity on a number of issues that do get discussed such as his "Advanced Theoretical Physics Project Disclosed" chapter - John Alexander's opening gambit. Here was his account of the group he brought together to attempt to get to the bottom of the UFO question and to find the "secret" official group that must have been operating. He comments in passing that Howard Blum got it all wrong in his 1990 book "Out There - The Government's Secret Quest for Extraterrestrials" - "most of the book is pure poppycock," John Alexander contends. While Blum may have presented a mangled picture of his attempts to divine the goings on of what was in fact the activities of Alexander's ATPP, we only get in John Alexander's book a limited insight into the ATPP, with a major focus being their attempts to find out who or what were doing the secret government UFO programme. As an "insider", with an impressive military background, he had the opportunity to get access and participation at a lot of fascinating levels. His conclusion is that there was no organised UFO programme, and he argues he asked all the right players, who should have known if such a programme existed. That said, I would have liked more clarity on the activities of Dr. Alexander's ATPP group. We do get some limited insights and some of the usual "suspects" including Bob Woods then from McDonnell Douglas (who these days seems focused on arguing the reality of MJ12 - something that Alexander argues is much to do with myth making and people with "too much time on their hands") and Howell McConnell of the NSA, but transparency is not the main game. Dr. Alexander's ATPP journey to find the "UFO truth" is indeed engaging and fascinating. The chapter on Corso is enlightening and with its insights gives us little reason to attach much credibity to the alleged revelations in "The Day after Roswell." The chapter on the Condon Report is especially interesting particularly for his analysis that the "damage done" was lasting and on mission, and that it has implications for current attempts to get a new scientific study going. He warns careful what you ask for, because he argues that any major mainstream scientific study, would almost certainly be lock-step with the Condon fiasco and would more likely set back the cause of serious scientific study. He arguments may have merit, but I think there is room to move in this area, providing the right moves and focuses are pursued. "UFOs are real! With no prevarication or qualification of terms, there are physical objects of unknown origin that do transit our universe. The evidence that supports those statements is simply overwhelming. That evidence includes both hard data collected via multispectral sensors and from high-quality eyewitnesses that are neither misreporting facts nor delusional. Determining what these objects are, let alone the question of origin, is another matter. There are no simple solutions that fit all the facts." Alexander fleshes out this position in his "Real Cases and Hard Data" including Bentwaters (that will attract a lot of debate), Cash-Landrum, Mansfield Ohio, the Pheonix Lights, Gulf Breeze (another controversial choice), strategic missile intrusions in the US and USSR (Russia etc), the 1968 Minot case, some limited coverage of case material from Brazil, China, Chile, Peru, Turkey, Mexico, Germany and Antartica. In the latter case, Alexander reveals that US Navy Captain Paul Tyler (involved in attempting to ferret out the helicopter presence in the Cash-Landrum case) was also a member of the ATPP, who revealed that Antartica all-sky cameras had periodically picked up unknown object tracks. Two previously unknown cases are also highlighted in this chapter - the Eskimo Scouts cases and a 1970 Vietnam War encounter near the Cambodian border region in the Mekong Delta - "Watching War." As John Alexander was an early member of NIDs and one of the first NIDs scientists to "pull a watch at Skinwalker Ranch" (subject of Dr. Colm kelleher & George Knapp book "Hunt for the Skinwalker" book) we get some recounting of intriguing events, but no real new insights into the activity there. Surprisingly he does not address significant issues raised about the NIDS "Skinwalker ranch" saga in Dr. Frank Salisbury's 2010 updated version of his fascinating 1974 book "The Utah UFO Display." This seems another example of the circumspect and limited approach to controversial and provocative data which deserves to be reviewed in greater and more transparent detail rather than circumspect and limited ways. The Skinwalker saga remains fascinating, but much is mired in the limited data released to date and the lack of transparent and detailed reporting. This seems to be the result of the limitations placed on various players by NIDS founder Robert Bigelow. Hopefully further data might be forthcoming to truly clarify the striking claims made about the place. Meanwhile I will still try to shake off the deja-vu feelings I get with the striking resonances I felt about the Skinwalker ranch saga through my experiences on the Dorrigo plateau around the small community of Tyringham in 1973. Dr. Alexander discusses "precogntive Sentient Phenomena" (the phenomenalogical "boundary problem" interplaying with the "trickster" element - "high strangeness" with diverse appearances), which leads him to propose the "step back proposal" - confronting the complexity of the problem we are trying to solve, which might develop new "reasonable designs on how to procede." Other issues get an airing, such as abductions in a limited way, but he does get hung up on his rejection of MILABS (military abduction) claims (over 7 pages), where alien abduction claims get little more than just over one page. Alexander concludes, "We are not close to solving the enigmas posed by UFOs, rather we are still on the front end of defining the fundamental issues and boundaries." Issues included and boundaries considered are fundamental to the progress or lack of progress. Some seek to spread the net widely. Others are more focused. Dialogues like Alexander's book offer some interesting insights, analyses, and reality checks. 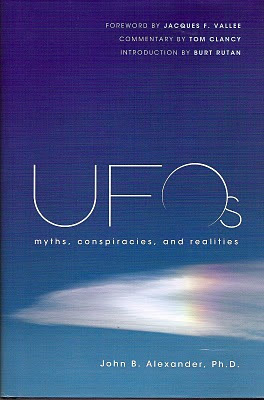 With a foreword by Jacques Vallee, commentary by Tom Clancy and an introduction by Burt Rutan, coupled with 4 pages of advanced praise for the book from a range of interesting players, it is clear that those interested in UFOs need to get beyond the conspiratorial and fanciful takes on the subject. Alexander's book helps in this area, despite its author being the subject of many such takes. UFOs - A TURNING POINT?